HTML and CSS have dominated web development for more than a decade, but these technologies - and the ways developers use them - have accumulated some incredible and intricate junk along the way. 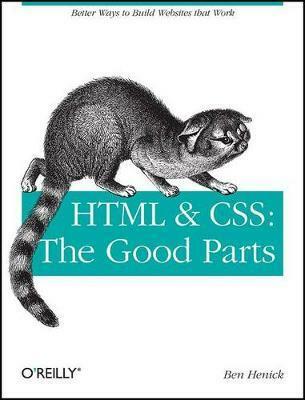 In "HTML & CSS: The Good Parts", author Ben Henick removes the junk code, the bolted-on parts, and all those ideas that once made sense to reveal a core set of reliable components that will spare you hours of battling browsers and adjusting page layouts. This book covers all aspects of web page design, from typography and color to layout, to help you: learn which pieces of HTML and CSS deserve focus, and which can be abandoned; discover how the two technologies tightly mesh; understand how the Web 2.0 era has changed the way we use HTML and CSS; set priorities and choose components that will work reliably across sites and browsers; and, recognize the bad and downright awful parts of HTML and CSS, along with the good, to understand why warning labels are sometimes necessary. Whether you handcraft individual pages or build templates, "HTML & CSS: the Good Parts" will help you get the most out of HTML and CSS without being trapped by junk code. Ben Henick has been building Web sites since September 1995, when he took on his first Web project as an academic volunteer. He has worked in nearly every aspect of site design and development, from foundation HTML through finicky CSS to larger scale architecture and content management. He has written for A List Apart, the Web Standards Project, and most recently for Opera Software's Web Standards Curriculum.